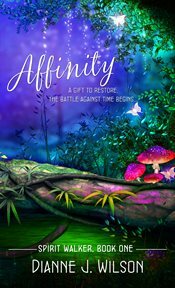 The item Affinity, (ebook) represents a specific, individual, material embodiment of a distinct intellectual or artistic creation found in Charlotte Mecklenburg Library. Kai was born with the ability to see brokenness and to fix it. But when a freak accident leaves him trapped in the spiritual realm, he discovers a sinister side to being gifted-- much darker than he'd ever imagined. With Affinity Recruiters hunting him down, Kai has to learn how to stay alive, use his gift to save his friends and stop the flood of evil threatening the world. Can he do it before time runs out?